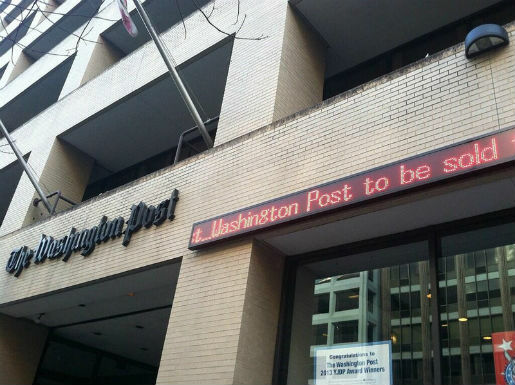 The Washington Post headquarters Aug. 5, featuring a ticker announcing its own sale to Amazon founder Jeff Bezos. Photo by Adam Glanzman and used here with a Creative Commons license. D.C.’s hometown paper announced Aug. 5 that Jeff Bezos, founder of Amazon, bought the Washington Post and a number of other Post Co.-owned newspapers for $250 million. The Post has been controlled by the Graham family for 80 years. Here’s how journalists — at the Post and beyond — reacted to the news, as well as all the background on Bezos and his deal with the Grahams. "Though everybody knows Amazon, not everybody knows of its founder, who has been compared to Steve Jobs for his ability to innovate and revolutionize media industries." Zach C. Cohen is an editorial intern for PBS MediaShift studying abroad at la Universidad Nacional in Heredia, Costa Rica. Get regular updates from @Zachary_Cohen on Twitter or on his blog. I don’t always read Storifys about breaking media news, but when I do, I prefer Storifys compiled by Zach C. Cohen. A biased endorsement, but I’ll take it. Thanks, Rhys! This means the Washington Post will not be bought by the likes of Murdoch. There were always rumors that the right wing destroyer of journalism was eyeing the Washington Post next. Now that is taken away.